Kimberly Buckheit, the principal of Troy Howard Middle School in Belfast, receives a sash and a bouquet of flowers from Emily Harriman, 13, the student council president during a ceremony to honor Buckheit's selection as Maine's Middle Level Principal of the Year by the Maine Principals' Association. Kimberly Buckheit, principal of Troy Howard Middle School, was named Maine's Middle Level Principal of the Year by the Maine Principals' Association on Tuesday. 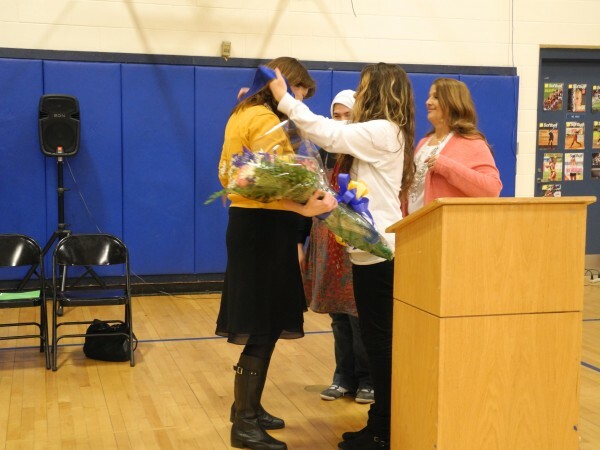 BELFAST, Maine — The Troy Howard Middle School gymnasium erupted Tuesday afternoon with cheers, stomps and applause from hundreds of pupils who were just plain thrilled that their own principal, Kimberly Buckheit, was named Maine’s middle-level principal of the year. Buckheit was given the award by the Maine Principals’ Association. She has been the head of the middle school in Belfast for nine years and before that was an elementary school principal in the same district, now reconfigured as RSU 20. 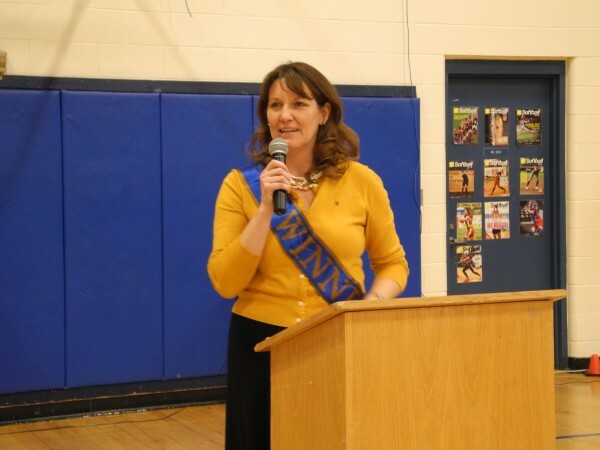 In a news release announcing the award, Richard Durost, executive director of the Maine Principals’ Association, said that Buckheit brings high energy and passion to her role as principal. One of those things that Buckheit said she is proud of in her school is its reputation for strong leadership. Several years ago, the school adopted the restorative justice model of giving students who have misbehaved or otherwise caused harm the chance to make amends with the victim and the community. She said that being recognized by the principals’ association was special. “It’s special most for me in that it really reflects the hard work we’ve done at the school,” Buckheit said. She described her own leadership style as hands-on and interactive. That adds to a school atmosphere that is generally positive, Harriman said before giving a giant bouquet of flowers to Buckheit at the ceremony. “I know everyone wakes up in the morning and dreads coming to school, but it’s always better when the environment isn’t dreary,” she said to a room packed with her peers, RSU 20 officials, Buckheit’s family members and media representatives. The principal then made a “victory lap” around the room, giving high-fives to the exuberant students as she ran. “I have been thinking that I’m only as great as the people I work with here,” she said. Superintendent Brian Carpenter, the head of RSU 20 — which has made headlines in recent months for its drawn-out contract negotiation process with the district’s teachers and the efforts by a majority of the towns to withdraw from the district entirely — said that Buckheit’s recognition was a good thing for the district. RSU 20 includes the communities of Belfast, Searsport, Belmont, Frankfort, Stockton Springs, Northport, Swanville, Morrill and Searsmont.